THE STORY - Cassie, a single mom and realtor, hustles to sell increasingly worthless subdivision houses in the midst of the 2009 housing slump, even as she dodges collection calls on her own multiple past-due mortgage payments. When the unstable Sonny, a disgruntled buyer in danger of losing his home, turns up at Cassie’s office, things quickly spiral out of control. Despite Sonny’s assertion that he’s “a really good person,” he knocks Cassie out, kidnaps her, and drags her along on his impulsive spree of violence. An extensive game of cat-and-mouse between the two ensues, set within a sparsely inhabited housing development. THE GOOD - Danny McBride is ever watchable in this deranged and hilarious role. THE BAD - Not to be taken seriously. Message is a bit muddled. ​​​“Arizona” is one of those grindhouse, B-level, campy, over the top, thrillers which you would just so happen to find buried deep within your Netflix recommended pile at two in the morning. It brings absolutely nothing new to the table, is not overly ambitious and I am still not entirely sure if its hidden message about the housing market crash of 09 and how all those were responsible were simply putting on a good face proclaiming to be a nice guy” with your interests at heart, entirely works either. What does work, however, are the cheap laughs, outrageous moments and a deliriously hysterical and mad performance from Danny McBride. It may not be winning any awards, but “Arizona” sure is a lot of fun. Taking place in Arizona in 2009 right around the time of the great housing market crash, Cassie (Rosemarie DeWitt) is divorced (Married to Luke Wilson), raising her daughter, in a house, she can no longer afford, sold to her by her own abusive boss (Seth Rogen). One day at the office, her boss receives an unexpected visit from Sonny (Danny McBride). Angry and seeking answers as to why he was told his house would bring him a fortune and now it has brought him financial ruin, Sonny ends up kidnapping Cassie. Attempting to explain himself and his actions, his plans go awry when his own temper gets carried away and as a result, accidental (As he calls them) murders start taking place. Hoping that her ex-husband will get to her in time and that she can get home back safely to her daughter, Cassie desperately tries to find a way to escape from this unhinged maniac. Always trying to be polite one moment, then losing his temper and adding another human being to his ever-growing body count, Danny McBride finds a perfect starring vehicle for himself as Sonny. As a man who feels he has been wronged, he’s angry and out for vengeance but always seems to take it out on the wrong people. 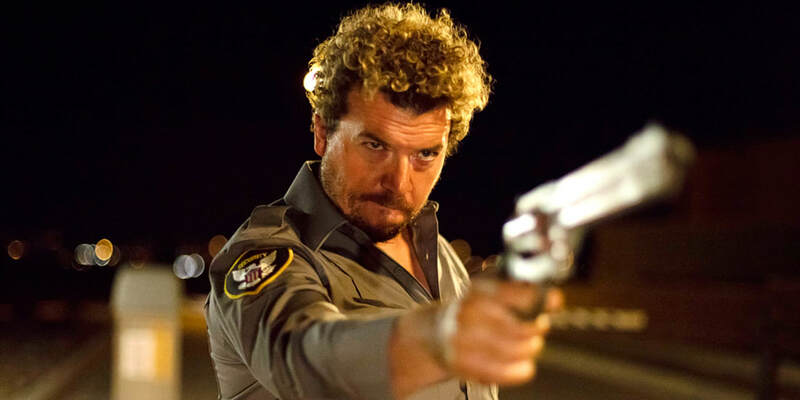 He is a mentally deranged psychopath and watching Danny McBride tear into this role is loads of fun and it never overstays its welcome at a brisk 85 minutes. There are supporting turns by Rosemarie DeWitt, Luke Wilson, Elizabeth Gillies and yes, even a brief cameo by Seth Rogen as one of the home brokers who had a hand in setting up Sonny for financial failure. None of them, however, are able to burst through the material quite like McBride is able to, allowing their performances to be campy when need be but without any extra layers of depth. “Tell me why this is happening?” One character asks in “Arizona.” While I am not entirely sure, it’s not so far fetched to simply assume that the message of the film is an overly simple one (The bankers ruined our lives, tried to cover it up and lied to us. So, in essence, they’re very bad and they’re out to get you), it does not take away from the fact that “Arizona” is the kind of late-night slapstick thriller-comedy that can be enjoyed without that extra layer added to it. McBride’s character Sonny is one of the best the actor has ever been given the opportunity to play and he relishes the opportunity. It’s evident that he’s having an absolute blast on screen with all of the character’s idiosyncrasies such as his proud invention of merging wine with ice calling it “WICE,” or complaining about pain in his back or even playing a golf game app in between attempting to murder his next victim. It’s a credit to McBride that we always feel that Sonny is a danger and not an absolute joke.